Palestinian demonstrations, resulting in huge casualties. 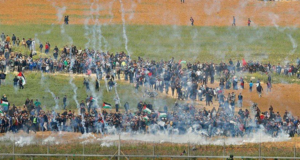 Since it’s foundation, ISM has seen live ammunition become far less common over time and the Israeli Army now utilize tear gas, sound bombs, and rubber coated steal bullets, more often as alternative crowd dispersion techniques. This is largely due to the presence of international and Israeli activists at demonstrations, something ISM has been central to. During the second intifada we notoriously ran past soldiers into the Mukataa, Arafat’s compound which was under siege, the shelling stopped with a mixed International presence. A similar story unfolded at the same time in the siege of the church of the nativity in Bethlehem. In 2004 ISM marched with Palestinian and international activists along the route of the Apartheid wall in the West Bank at the invitation of the effected villages. The march gathered momentum over a number of days, and upon arrival at the Qalandia checkpoint numbers had reached over 1000. 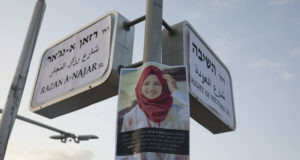 The Israeli Army was unable to stop the march as it crossed into occupied East Jerusalem. We cannot fail to mention that through the years farmers have gained increased ability to implement their rights to access their lands during the olive harvest with help from international volunteers and advocacy. Since the most recent 2012 bombardment activists have accompanied Palestinian farmers onto their fields in the military ‘buffer zone’ enabling them to work their land, despite coming under fire on occasions. In Israel’s buffer zone for the first time, soldiers have begun using tear gas and firing warning shots rather than shooting to kill. In the West Bank, ISM activists have recently been vital supporters in Palestinian actions such as blockading settler roads, invading settler-only supermarkets, and we continue to join Palestinians on their weekly Friday demonstrations against the Occupation. We have been and continue to be ready for whatever arises on a daily basis. In a time of an increased need for international presence in Gaza and what looks to be a upsurge of violence in the West Bank, we call on international activists to join the ISM on the streets of Palestine. Volunteers of the ISM are requested to make a minimum of a two week commitment, long term volunteers are always needed. Please see more information on how to join. As an inspiration, you can read also “ What YOU can do as an International to help people in Palestine“.